Three older retired men--each with hearing loss--were playing golf one fine March day. One man remarked to the other, "Windy, isn't it?" September wouldn't be the same without crisp apples! This quick and easy apple crisp recipe will remind you why it's okay to bid farewell to summer. "We needed somebody to stay with my mother for a period of time when we couldn't have family members there. Visiting Angels' Care Staff really worked around my schedule because I was working while my mother was at home. When we had to switch days to accommodate my changing work schedule, Visiting Angels was very understanding; the Care Staff was very accommodating to the hours that we needed. The caregivers from Visiting Angels were very good! They were very attentive and I really felt they did a wonderful job. We had absolutely no problems with them." 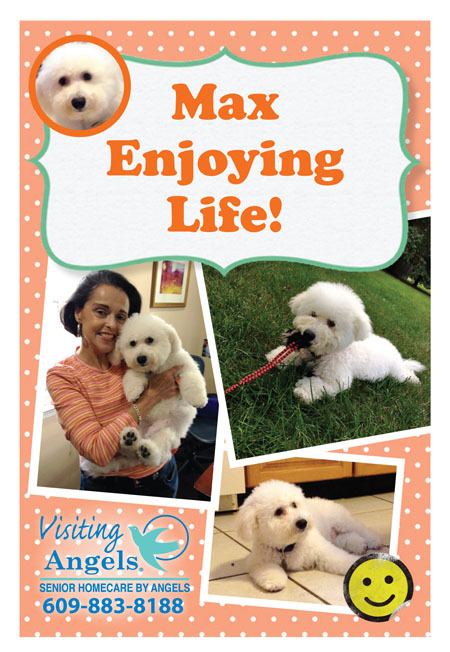 Max enjoying life at Visiting Angels! Summer is rapidly coming to an end, but there's still lots of time to enjoy spending time outside with family and friends in New Jersey. Whether it be for a Labor Day picnic, a walk in a park, or visiting one of the state's apple festivals this month, enjoy! Celebrate Grandparents on September 7th...and every day! National Grandparents Day is a day to honor all the special grandparents in our lives. Whether they're your biological grandparents or not, be sure to show how much you care about special seniors in your life; these ideas will help! If your vacuum is becoming increasingly more difficult to use, a Roomba vacuum is a great solution. Roomba removes dirt, dust, pet hair and other debris on its own. It vacuums every section of your floor multiple times, getting under and around furniture and along wall edges, detecting dirt, avoiding stairs and navigates to clean your room thoroughly. You can even schedule the vacuum to clean while you're away. For more information and to watch a product video, go to www.irobot.com. A hand held shower head makes showering safer and easier for someone who uses a shower chair. Massage choices on each shower head can provide relief for sore muscles and relaxation for the mind as well. Waterpik� has many varieties from which to choose. Visit www.waterpik.com for product information. Don't get caught with the cold or the flu. Take precautions today and everyday! The first day of autumn marks the annual Fall Prevention Awareness Day. Even the fear of falling can cause seniors can feel depressed, isolated, and hopeless. Prevention is key! Each month, Rudy Tervooren, Managing Director and Co-Owner, travels throughout the community visiting referral sources and attending client meetings. In August, Visiting Angels supplied delicious cupcakes and bottled water for Lawrence Senior Center's "Stay Cool Fun Night." Rudy gave a short presentation about our home care services to 85 enthusiastic seniors; a good time was had by all! This month's Community Resource Bulletin focuses on Healthy Aging Month. Press here to download a printable copy of our current month's bulletin. You will also find back issues of our "Community Resource Bulletin" from previous months on our website's resource page.